For the many years that I have been camping, I have used different flashlights which have disappointed a lot. Normally, I camp for 2 to 3 days. Hence, I carry everything that I need for that period. Before I came across the Nitecore p12gt flashlight, I used other brands which didn’t last through my camping trip. But since I acquired the Nitecore p12gt flashlight, I have really enjoyed my trips as it is able to last that long. Nitecore p12gt has a brightness of 1000 lumens, can run more than 3 weeks for 1 lumen, 4 modes, waterproof and lot more advanced features. Read this Nitecore p12gt review to know more about this light. The nitecore p12gt LED flashlight is one of a kind. It is an upgrade of the p12 flashlight. It is compactly designed and not a problem to carry in one of my pockets or attaching it to my belt using the lanyard. The durable construction makes the flashlight to survive the hardships of outdoor environment. It is IPX8 waterproof rated and thus can be used in rain. The friendly user interface makes using the flashlight to be easy and quick. 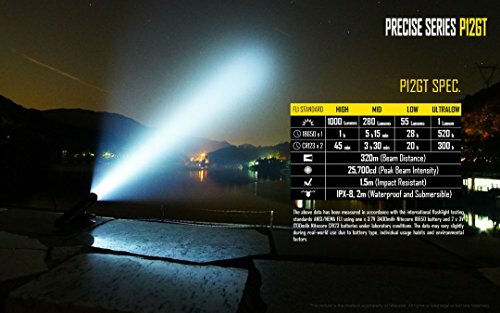 Its beam distance reaches over 320 meters on a maximum lumen of 1000. To know what level of battery power is remaining, you can check the battery level indicator below the side switch. This is the upgrade version of nitecore p12 flashlight. This flashlight comes with 4 brightness levels and 3 special modes. It is powered by one 18650 Li-ion battery and has a reverse polarity protection for avoiding bad battery placement. The Cree XP-L HI V3 LED bulb that it comes with is reliable and provides white light. As a matter of fact, this is the main difference between the nitecore p12 and nitecore p12gt flashlights. It has a precision digital optics technology that offers extreme reflector performance. In addition, the intelligent memory function makes the work of the user to be simple by recalling the last light mode. That one can rely on to function even in the toughest of conditions. The glass lens is made of toughened ultra-clear mineral that makes it to be scratch resistant and protects the Cree LED inside. Also, the switch is strong as it made of stainless steel. Pocket clip used to attach the flashlight to the front pocket is built from stainless steel titanium. 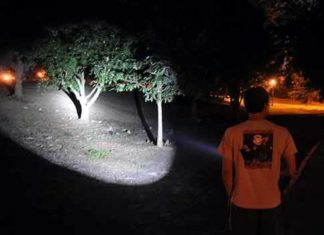 Outdoor enthusiasts prefer flashlights that don’t weigh them down as they carry on with their activities. The nitecore p12gt is a compact and lightweight flashlight suitable for carrying as you go camping, hiking, and hunting. It weighs 91g without battery. It has a stainless steel pocket clip that can be used to securely keep it in your pocket. Alternatively, you can use a lanyard or holster to attach it to the belt. The easy to use interface makes this flashlight to be loved by many. First of all, it has a tail cap switch which is used to turn on the constant on or momentary on function. Then, there is the side switch which allows the user to cycle through different modes. All of these can be operated by using just one hand. This flashlight is powered by one 18650 battery or two CR123A batteries. The 18650 Li-ion battery is highly recommended as it can be recharged and has a longer run time. Also, it is easy to carry as only one battery is needed when compared to the CR123A batteries where two batteries are needed. It has reverse polarity protection that prevents bad battery placement and a battery level indicator under the switch that indicates what battery power percentage is remaining. This is the most unique feature of the nitecore p12gt flashlight. This bulb delivers more light than that found in the p12 flashlight model. It is brighter and covers a longer distance too. 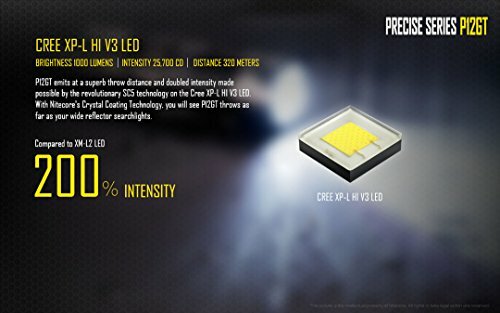 The CREE XP-L HI V LED chip is as well indestructible and offers a maximum of 1000 lumens. Also, it has a beam distance or throw of up to 320 meters. This can cover an entire football pitch. The brightness of this flashlight is assisted by the revolutionary SC5 technology on the Cree XP-L HI V3 LED bulb. Today’s flashlights usually have one disadvantage in common. When used on high or turbo mode for long, they tend to get hot. This is not the case with the p12gt 1000 lumen flashlight. It has advanced temperature regulation technology that quickly detects hot temperature and adjusts them immediately. It does so by changing from a high mode to a lower one. One or two light modes are not enough in a flashlight. That’s why the nitecore p12gt comes with 4 light modes and 3 special modes. If you want the flashlight to run for several days or hours, the most ideal mode to use is ultra low lumen. But for extremely bright light, the high mode is the best. Differs modes have different run times and lumens. These are as follows: ultra low mode -1 lumen & 520 hours, low mode – 55 lumens & 28 hours, medium mode – 280 lumens & 5 hours 15 minutes, and High mode – 1000 lumens and 45 minutes. This is another special feature of this flashlight. If you prefer using a particular light mode, then this flashlight will remember the last light mode before being switched off. If you are wondering whether the nitecore p12gt can function in adverse weather conditions or in tough surroundings, then the answer is yes. With the IPX-8 waterproof rating, you can use this flashlight underwater up to 2 meters for 30 minutes. This implies that it can as well be used in rain or snow conditions. Also, if crashed on a wall or falls down from 1.5 meters and below, the flashlight will still survive and function well. Using this flashlight is easy and fun. It has an anti-roll feature that can be removed for proper storage in the pocket. In addition, the user has the option of using the holster or lanyard to securely attach it to the belt when not in use. Some flashlights don’t offer a warranty or money back guarantee. But nitecore is an excellent and reliable brand. The nitecore p12gt comes with a 5 year factory warranty which is just great. Nitecore p12gt is a flashlight that offers steady and very bright light. With a maximum of 1000 lumens, this flashlight is great for both home and outdoor use. It has a maximum throw of over 320 meters and it can last up to 520 hours. Powered by one 18650 lithium battery, it will provide you with reliable light and charging is very easy and fast. 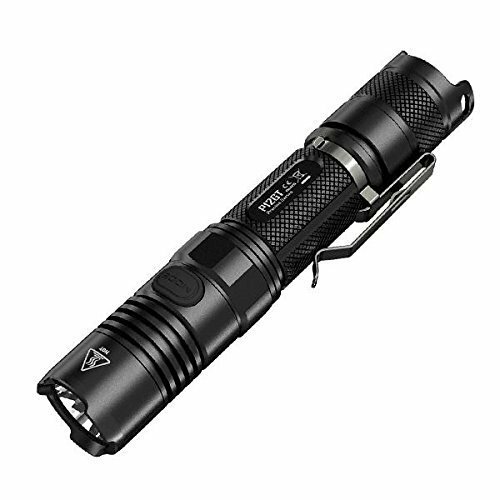 For individuals who have been looking for a powerful flashlight that is well constructed and lightweight, the nitecore p12gt is the best choice for them. The CREE XP-L V3 LED bulb it uses provides white light ideal for different conditions. If you don’t want to be disappointed on your next camping trip, carry this flashlight with you. 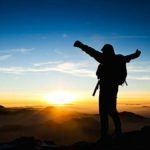 I hope you have gotten a clear idea after reading this Nitecore p12gt review.